Format: Region 3 DVD, NTSC, Japanese Dialogue with optional Cantonese dub and English and Chinese (Traditional) Subtitles. The third film in the latest incarnation of the “Initial D” franchise begins with a recap of the first two films in the series (which I reviewed back in April last year). For those who aren’t familiar with the series, it is set near Mount Akina in rural Japan in Gunma prefecture, north of Tokyo, where for a number of years young men have raced each other in supped up cars on the curvy road on the mountain using the drifting racing style. For years people have seen an old black and white Toyota Sprinter Trueno (aka AE86 or just plain 86) racing up and down the mountain early in the morning before dawn. It became the stuff of legend. The local racing group, the Akina Speed Stars, is challenged by a rival team, the Akagi RedSuns. However the leader of the Speed Stars, Koichiro Iketani, is involved in an accident and his car is out of commission. He discovers that a local tofu shop owner, Bunta Fujiwara, owns the car and decides to ask him to race against the RedSuns. However Bunta wants no part in it. Instead he send his son Takumi to race which horrifies everyone as they consider him to be a guy who knows nothing about racing and he isn’t even interested in cars. But what they don’t realise is for years every morning around 4am, Takumi delivers tofu in the AE86 to a hotel on the other side of the mountain. He’s the one in the legendary car. At the race, Takumi easily beats the RedSuns and continues to beat anyone who challenges him, even though he has little interest in racing in the beginning. At the end of the second film, Takumi is sent a challenge by Ryosuke Takahashi of the RedSuns. The new film begins with Takumi’s dorky friend, Itsuki Takeuchi, buying a Corolla Levin AE85, which he mistook for an 86. It has far less power than an 86. On the mountain Itsuki is publicly humiliated by a group of racers. Enraged at this, Takumi gets in the Levin and chases the racers down and passes all of them with ease. Itsuki thanks him and realises that’s not the car which wins races; it’s the skill of the driver. He vows to practice and become a proper racer. With the battle with Ryosuke Takahashi fast approaching, Bunta decides to change the suspension settings of the 86. Ryosuke also detunes his car as he thinks lower horsepower will help him win the race. Meanwhile Takumi’s relationship with Natsuki is blossoming. On a date Takumi explains why he hit her ex-boyfriend. He was bragging about his sexual exploits with her in a change room at school which made Takumi mad. Natsuki felt a bit bad about not taking to Takumi about it. However he easily forgives and the pair kiss. Going to the next step in their relationship has left Takumi in a daze. Itsuki tries to make him snap out of it before the big race so the pair go up to the mountain where they encounter an impromptu race between two local racers. On the day of the race, Ryosuke announces that if he loses, he’ll give up street racing, but the RedSuns will continue their plan to dominate the Kanto racing scene. The race begins, however it seems that Takumi may lose for the first time. As I have previously said before, I never really got into this franchise back in the late 1990’s. The original anime series was this weird mix of traditional animation mixed in with low resolution CG cars which did not mesh well at all and terrible Eurobeat music to boot. There’s also the rather ugly character designs and all that testosterone. The anime franchise generally went non stop for a decade from 1998, and then was rebooted in 2012 then this three part film remake appeared in 2015 (released in cinemas over 18 or so months) for the belated 35th anniversary of Young Magazine who published the original manga. Luckily all three parts have now been released on DVD with English subtitles by Hong Kong video publisher Neo Films. I seriously doubt this trilogy is on any western distributor's radar, so this is the only way to see it legitimately. I’ve already said enough about the franchise in my previous review of the first two films, so this review is going to be much shorter than normal. This film does feel a little more sedate than the previous two entries. There are three main battles, however they don’t seem to be as exciting as what has come before. Sure they’re adrenaline filled and have some spectacular action, but a lot of the elements that appeared in the first two films such as internal shots of engines and the glow of disc brakes at night are oddly missing. There’s also a lot more scenes filled with dialogue which slow the film down. Few of these scenes actually propel the story along or add any real insight to any of the characters, except those with Natsumi and Takumi. We know from the end of the second film that Ryosuke’s battle with Takumi is coming up, it just takes so long to get there. The film also has speaking roles from what I think is the only female racers in the franchise; Impact Blue which consists of Mako Sato and Sayuki. In the original anime adaptation they got a two part OVA series dedicated to them, but here they are confined to commenting on Ryosuke and Takumi’s driving techniques. It’s interesting that the film makers decided to change Natsumi and Takumi’s relationship quite a bit. Certainly I don’t think it was like this in the anime. Certainly with the flashback to Takumi punching Natsumi’s ex, it makes Takumi look far more aggressive and less passive and benign than in the original anime series. Neo Film’s English subtitles, like the other two films, are barely passable in my book. They’re quite literal, have a fair amount of typos and can be quite a chore to get through. Make no mistake, most of the time they’re quite understandable, but the more complex the dialogue is on screen, the more incomprehensible they become which is really annoying for the viewer. I think to a large the degree, the subtitles lessened my enjoyment of the series overall. They’re certainly not up to snuff when compared to the standard of other western anime releases. 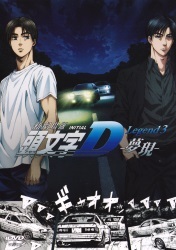 As a whole, this adaptation of the original “Initial D” manga was quite good. The animation all gels together unlike the original TV series, and the action is almost always exciting and exhilarating. But the character designs are not only ugly as hell, they really feel they’re from another era and at times look so mid 1990’s, especially with the clothes. I also thought the makers of the film were really padding things out until the final battle. As a result I can only give this film 6 out of 10. Remaining Backlog: Seven TV series, one OVA and one movie. In addition I am also waiting for the second part and movie of one TV series to be released before viewing it.